The new version of Windows Server is shipping soon, and it combines solid improvements to key features like storage, virtualisation and high availability so your server systems can keep running, with much wider support for users who want to connect to your business systems with iOS or Android as well as with Windows or Windows RT devices. This is Microsoft acknowledging that we're using much more than PCs to get work done these days, but still giving IT admins options for controlling access and protecting information. These connections use the new remote access role in Windows Server 2012 R2; this gives you a way of letting iOS, Android, Windows RT and even Windows 8.1 users do a workplace join instead of joining your Active Directory. The first level of this gives you a record of which devices are connecting to your systems and lets you publish web apps through the Web application proxy so only your users get access; the second level lets you control settings on those devices – not as many as with Group Policy. Of course, much of the software your business uses are probably Windows programs rather than Web apps. 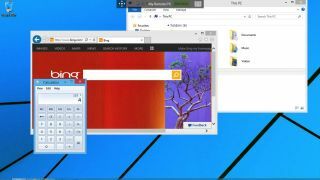 For the first time, Microsoft is now creating official remote desktop clients for iOS, Android and Mac OS X (they will be in the relevant app stores by the end of October). If you need access to files from your server while you're travelling, without a remote connection, the new Work Folders feature will sync a folder from a share on the office file server – and update it with your changed documents, without you having to connect via VPN. When Windows Server 2012 R2 ships that will work with Windows 8.1; in the first half of 2014, Microsoft will release clients for Windows 7 and iOS (Windows 8 users will need to upgrade to Windows 8.1). Work folders still isn't a replacement for offline files, because it syncs the whole file when something changes, not just the changes, and it tries to sync the whole folder on the file server. It does know when there are too many files to fit on your device and it won't try to copy them all, but at least in this version, you can't pick and choose the files you want to sync unless you're prepared to put them in a separate folder (admins can pick one specific folder inside your home directory on the server as the one that syncs, but that means thinking about the folder structure more than most people want). Talking to the work folders team at Microsoft, they're aware of the issues – and of the fact that Microsoft has multiple sync options with offline files, work folders and SkyDrive Pro. As future Windows Server updates arrive, selective sync is high on their list of improvements – but we're not expecting the next version of Windows Server to arrive as quickly as R2 did. The release version of Windows Server 2012 R2 looks very much like the preview; what's changed is the quality of the code underneath it, which seems smoother and snappier. It's impressive how much Microsoft has added to Windows Server in just a year, without any drop in quality. The speed of development for Windows Azure is helping here. And the influence of Azure is visible, not just in the Azure Pack – which lets a company or a hosting service bundle up resources like storage, memory and the ability to run virtual machines into a portal that looks just like Azure, so you can set up a Linux VM or a WordPress site on a Windows Server system exactly the way you would on Azure – but in the blurring of the lines between what's in Server and what's a service.